There’s no better way to inject some romance into the bedroom than by using the right lighting. Once you lower the lights, your bedroom can become a soft, comfortable place where you can easily relax and destress. Heighten the affection in your bedroom by using one or several of these romantic lighting ideas. 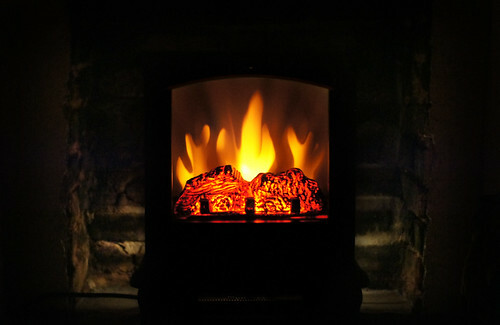 Few things are more romantic than curling up in front of a warm fireplace. What’s more, fireplaces are easier to come by than most people think. Even if you don’t have a fireplace in your home, you can buy a freestanding ventless fireplace to enjoy a low-cost alternative to a traditional fireplace. Electricity, alcohol-based gels, natural gas, and propane are all options for powering ventless fireplaces, making them particularly convenient. One of the easiest ways of inducing a romantic mood in your bedroom is by installing a light dimmer, opening up a range of lighting moods. A dimmer light switch equipped with a touchpad can let you return the lights to a preset level with a tap, or instead you can use a selector whose multiple buttons let you jump to your favorite setting. Some dimmer switches even come with a remote control, saving you from having to get out of bed to create the mood you desire. Color can affect our moods — thus the popularity of chromatherapy, which uses color to bring about physical or psychological changes. You can enjoy the benefits of a spa in your own home by incorporating colored lights into your bedroom: turquoise to reduce stress or magenta to reduce anxiety — and red to ignite passion. Nothing says romance more than candles do. For a truly romantic evening, turn off all other lighting and place lighted candles around the room. Because scents are often tied to memories and emotions, infuse the room with smells known to kindle passion — perhaps scents of foods such as vanilla, cinnamon, or warm sugar. If you like flowers, choose the smells of lavender, rose, or jasmine, which can bring back memories of blooming gardens and of flowers delivered on special occasions. Surround your bed with a canopy draped in Christmas lights and you’ll never want to get out of your bed. Best of all, doing so takes very little effort and can be done no matter the season using lights from Christmas Lights Etc and sheer canopy fabric. By weaving the lights through the fabric, you can create soft, beautiful lighting effects. When you’ve finished, hang the canopy above your bed using wooden dowel rods, curtain rods, a hoop, or a metal rod. Whether you use the open flame of a candle, softly twinkling Christmas lights, or the modern touch of a dimmer switch, bringing romantic lighting to your bedroom can help you create a warm, comfortable space in your home. Tagged Christmas Lights Etc, Dimmer Switch, Few Candles, home. Bookmark the permalink.